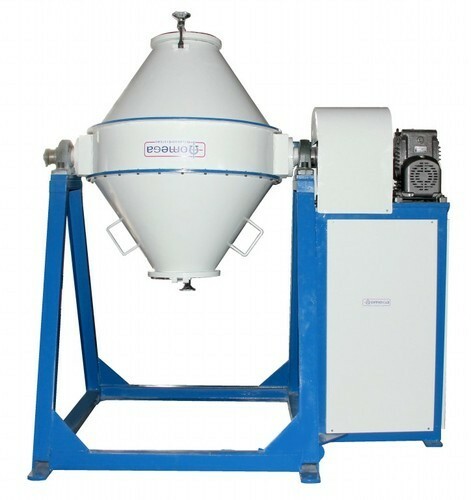 We are instrumental in offering a commendable assortment of Dry Mixer - Rotating Double Cone to our deemed clients. These mixer products are highly appreciated for applications in several engineering and chemical industries as per their needs and requirements. Our team makes sure to use excellent grade raw material to fabricate a fault free range with utmost precision. Moreover, clients can avail this range from us as per their needs and requirements. We, Omega Weld Rod Systems are an eminent since 2011 organization engaged in manufacturing, supplying and exporting a top class range of Welding Machinery & Wire Plants. Omega Weld Rod Systems is a ISO 9001:2008 certified company.Omega Weldrod systems integrates the principles of ISO 9001:2008 within its overall management system. In order to verify continued conformance to ISO 9001:2008 requirements, British Certification Inc,India, our global registrar, regularly evaluates our Quality Management System through on-site audits.Products that we offer include Dry Mixer - Rotating Double Cone, Wet Mixer, Briquetting Slug Press, Wire Straightening & Cutting Machine, Wire Feeder Vertical, Conveyor Unit, Bell Housing Type Extruder and others. Along with this, we offer PRE Block, Wet Wire Drawing Machine, Copper Coating Unit, BB Block, 15 kg Spooler, Winder Plants and others. Moreover, our offered range is broadly apprehended for their notable features like dimensional accuracy, robust construction and low maintenance that enables us to meet the patrons demands in a fruitful manner. The above mentioned machines are precision engineered in sync with the industry laid parameters to meet the expectations of patrons in a well defined manner. This range is manufactured under the able guidance of assiduous professionals who make use of qualitative raw material that is sourced from the most certified vendors of the industry. Moreover, our offerings are broadly accredited in the market as they efficiently meet the desired requirements of diverse industries and sectors. Besides, patrons can avail from us this consignment in various sizes, grades and other dimensions along with customized options as per their needs and demands. We exports our products all over world like South East Asia, East/Middle Africa etc.